Videos have been used at NC State for decades. With advances in video technologies and production capabilities, DELTA continues to see a return on investment in equipment and personnel because of its commitment to creating videos with high integrity. DELTA takes pride in creating resources for students and faculty that will ultimately enhance the learning experience. A helpful resource for students and faculty is the continued production of faculty portraits as an introductory video. These short video segments are a way for online and distance education students to get to know their professors in a way they otherwise would not be able to. Previously, the introductory videos were called welcome videos and showed the instructor as a “talking head” with the focus on course information. According to Swanson, faculty portraits have been enormously helpful because they give students an idea of what it will be like working with a specific instructor. Video production staff start by interviewing faculty and then turn it into a 90-second story highlighting the faculty member’s personality, career and teaching style. The videos are packed with information and carefully cut together to make a full, engaging and powerful presentation. The stories in the faculty portraits are a way for students to start a conversation with faculty on a more personal level. Assistant Director for Instructional Media Production John Gordon said the videos are effective for students because they are stylized with unique shooting angles, editing and use music. DELTA production staff like creating faculty portraits because they provide an opportunity to try new production techniques and to stretch capabilities. Since each video is filmed in a two-hour time frame, producers have to be creative about the delivery. Faculty portraits are not dated and can be used in a wide range of environments. A faculty member can show his or her video as a way to introduce themselves to the audience at a conference. The portraits may be embedded into their website and repurposed for promoting programs. While videos have been used for many years, their impact and importance to universities operating in the online and distance education environment has changed substantially. Gordon explained that well designed and produced instructional videos help NC State’s Online and Distance Education programs compete against others around the world. The videos shine a positive light on those making their first inquiries into an online program. “Video is the appetizer; the conversation after watching the video is the main course,” said American Filmmaker and Author Tiffany Shlain at the 2016 HOW Design Live Conference. This quote is regarded as Gordon’s team’s motto. Video serving as a gateway to a conversation is just one of the many benefits of instructional videos. 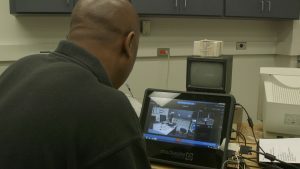 According to Gordon, good instructional videos can motivate students to learn, quickly and effectively take students to locations they would not normally see and allow students to see close-up what they cannot see in a large classroom. “We are combining traditional cinema filmmaking techniques to highly designed, highly customized instructional material to create films that engage, tell a story, start a conversation, generate curiosity, clarify a point, or teach how to do something,” said Gordon. In Annette Moore’s Parks, Recreation, and Tourism Management (PRT) 358 class about recreation program planning processes, students are required to choose a service-learning site in the community to create a semester-long program. They select a location that is a best fit for them. Moore received a DELTA grant in the 2014-2015 cycle with the class launching in Fall 2015. With the help of the video production staff, Moore used instructional videos to help students find their perfect service learning site. Moore added, “Students appear to have a better idea of which sites they want to partner with, and are overall more content with their site once assigned.” She further explained that students indicate they are more comfortable once they meet their supervisors, having already seen the locations and heard about them via videos. From service-learning sites such as city parks to the Cary Senior Center, the DELTA video production staff worked to create memorable videos for each site to enhance student success by helping them choose a place that fits their needs and expectations. Other classes such as Thomas Dow’s mechanical engineering course are employing the use of instructional videos. In this course, DELTA production staff helped Dr. Dow use Mediasite to view three different angles of a microscope lab at once. According to Robinson who produced Dow’s video, the three different screens showed a person physically manipulating the microscope, the actual microscope video and the computer screen with compiled measurements. Students are able to see the direct results in real-time. Robinson said old techniques would not let students manipulate the video to see all three screens at once. The new techniques are a way to help students see all angles and feel like they are really using the microscope themselves. Professor of Forestry and Operations Research Joseph P. Roise received a DELTA grant for an online course in Fire Ecology. Dr. Roise explained how exciting witnessing fire ecology and its effects are in the field; however, he was challenged with displaying those effects virtually. With the DELTA grant, Roise and colleagues were able to overcome that challenge with the use of creative instructional videos. “From Fire Comes Light” was a video created to showcase the Shaken Creek Preserve, a biodiversity hotspot. It is 600 acres of protected longleaf pine ecosystems, and has sections of the most unique plant diversity in the entire North Carolina Coastal Plains region. The video is designed to engage the student by telling a story. According to Gordon, it tells the story of controlled burns, of a conservationist and of the rare plants found in the preserve. As one of three main media components of the course, the video aims to show the importance of biodiversity hotspots and fire ecology. Without the frequent prescribed fires, the immense plant diversity would be lost. The video has many layers intended to engage students and generate a conversation with professors. In just the short six-minute video, DELTA’s instructional design and video production teams were able to satisfy the learning objectives which included explaining the role of fire in promoting diversity, community composition and community structure and how fire suppression has threatened these things. Gordon explained how the video compared and contrasted areas with prescribed fires and areas without. “How many words would it take to show the same difference? It’s a very efficient delivery of stories,” he said. Since physically taking students to Shaken Creek would not be logistically feasible, the video allows students to see the preserve to align themselves with the importance and uniqueness of biodiversity hotspots. At the end of the course, Roise is implementing a final student-created video research project. “We want to get the students excited and involved in producing an interesting visual product; we still have term papers, but the result is visual — which young people enjoy watching,” Roise said. 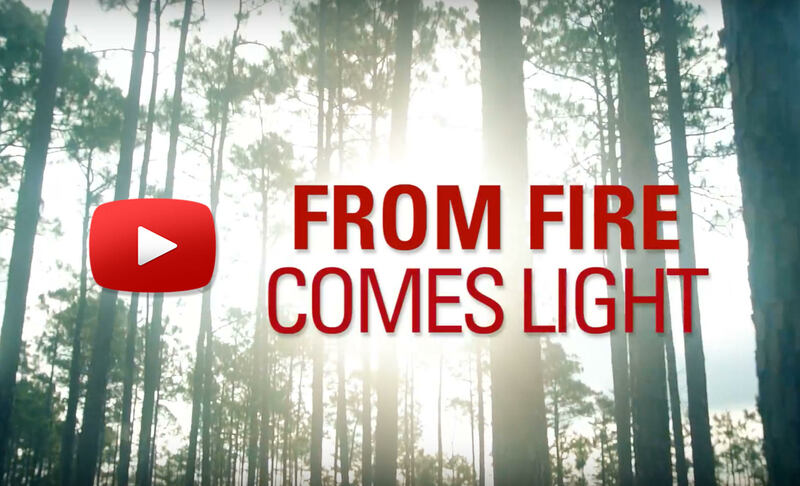 ”From Fire Comes Light” has put NC State in front of people interested in fire ecology and showcased the incredible work of the DELTA production staff. The video has been requested to be screened in the Hunt Library lobby, on the College of Natural Resources website, at the American Geophysical Union 2016 Fall Meeting in San Francisco and on The Nature Conservancy website. Overall, Gordon explained how instructional videos are able to be used semester after semester, and the videos focus on specific topics to communicate that subject very quickly. Each of these instructional videos has a specific focus and collectively aims to enhance student’s learning and success. Creating instructional videos has also been a way for faculty and video production staff to collaborate. Swanson explained that to produce the best video, the video production staff has to have a good understanding of what faculty members want and also the basic content. “Sometimes the content expert may not necessarily be the expert on how to film. If you get those two experts together and there’s a common understanding — that’s when the best results happen,” Swanson said. According to Swanson, the DELTA video production staff are constantly looking for ways to improve. They are dedicated to making sure each recording has good integrity and does not have audio drop outs or other technical issues. “Everyone is committed to student success and making sure our classes are the best they can be; it does translate into very high caliber courses,” Swanson said. Swanson explained that campus students are also selecting online and distance education classes. The continuous enrollment shows they are getting a quality education. In the future, Swanson said she hopes to see new technologies and even more faculty using videos and video recording capabilities in every classroom on campus. She added that she hopes to be able to fulfill more requests for the high-quality videos her team produces. “This is a wonderful video production unit but it’s at capacity,” she said. As an integral part of Distance Education, instructional videos will continue to transform learning and add to student’s success and experiences.